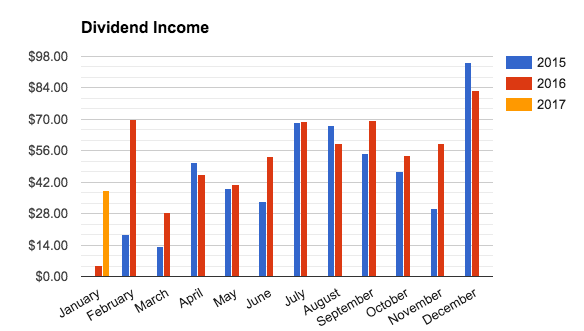 I have collected $38.20 in dividend income so far this year! 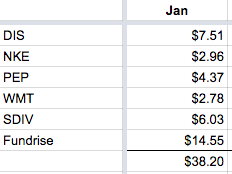 This month I received income from SIX different sources. This is fewer than December, but I expected January to be a slow month. 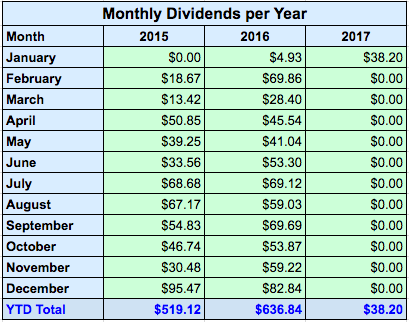 Compared to 2016 my dividends in January increased by 674.85%. This is purely due to me not investing in dividend stocks at the beginning of last year when I earned only $4.93. Clearly, my slow but steady buying throughout the year has transformed my portfolio over this short period of time. It is definitely not yet where I want it to be, but I know I'm on the right track. There is a new investment paying out a dividend to me this month and it is no other than REITs from my Fundrise Account. This allows me to invest in real estate and diversify further while earning a solid return. I hope to eventually write a short blog post about my experience with it and how I am doing. Thus far, I have received dividends from it in two quarters. The next quarter will be the first time I receive my full dividend allotment as I have held some of its REITS for only a short period of time. ** See more charts below thanks to my friend at Two Investing. If you have not visited his site yet, I strongly recommend you do so. I found his Dividend Spreadsheet extremely useful. The Screenshots below are from his workbook, which give a good overview of the direction I am headed in. I appreciate everyone who has viewed and commented on my blog. As always, I strongly encourage you to comment even if you are just messaging that you have visited. I'd like to hear your thoughts and views. Also, I finally crossed 5k views in a single month on my site! THANK YOU! 2017 is off to a great start! Great job continuing to grow your passive income stream. Curious to know how you like Fundrise going forward. I know others use Lending Club or Prosper to diversify their passive income stream. Love seeing that year over year growth! Keep it up! I had looked into LC but actually haven't heard of Prosper - will have to check it out. I was concerned with the tax filings for these as many of the loans would be small and I did not want to get bogged down by too much information. So would like to hear more on that. I do like fundrise so far. This will be my first quarter that I will be invested for the whole period, so I will surely post the dividend return as it is paid out! Definitely would prefer to own real estate, but since I did not have enough for a down payment I figured this is an easy way to earn some passive income with a much smaller investment. Great job on the growth, curious about FundRise, have seen on a couple of other bloggers, how do you like it so far, can maybe you throw up a little review of your thoughts? I like it so far - not much for me to do on my end. I like that its not traded and tempting me to trade as I see fluctuations in stock prices as well as the fact that my main investment in the Growth eREIT has projected about 8% annual dividend as well as doubling equity over the anticipated term. 674% - Wow! That is one amazing growth even-though the amounts were small. Keep it up! As long as I continue to invest smart and consistently I only see these numbers growing next year! Even though you only had $4.93 last year, it is fun writing that you had such a large increase. I know I enjoy writing large increases. Not going to lie.... felt great typing 674%! Great job Mogul. I am very interested in hearing about Fundrise. Would you mind emailing me or replying specifically about that? Keep it up! Congrats on a strong start to the year. Its going to be great when those REITs starting throwing off their dividends. Look forward to watching your progress. Nice start to the year TDM! Love the upward trend. And thanks for the mention of my site! Count me in as someone interested in a post about Fundrise as well.